How about some gemstones inside your titanium wedding ring? Wha-a-at? Where no one can see them? Why would anyone do that? Well, one way of looking at it is it’s the couple’s secret that no one else knows about unless the wearer chooses to tell them. Others may like the symbolism of gemstones but don’t want visible bling on the ring they wear every day. What is a custom titanium ring? A custom ring is obviously not what you see if you walk into a store and buy something already made. We make all our rings from scratch to the customer’s specifications, so in one sense, all of our rings are custom-made. Besides changing the overall width of the ring or just the width of an inlay, we can often mix-and-match other elements. Don’t like the shoulder cuts of this one? Read more about What is a custom titanium ring? Since launching our titanium ring resizing service, we’ve had the opportunity to see the diamonds that other manufacturers use in their titanium rings. From smaller to larger, many times these diamonds are inferior stones, especially when viewed next to diamonds of higher quality. The sad thing is that for smaller diamonds, the price difference is not that big. There are a couple of myths circulating about titanium wedding rings. These false tales are believable because of, quite accurately, titanium’s incredible strength. 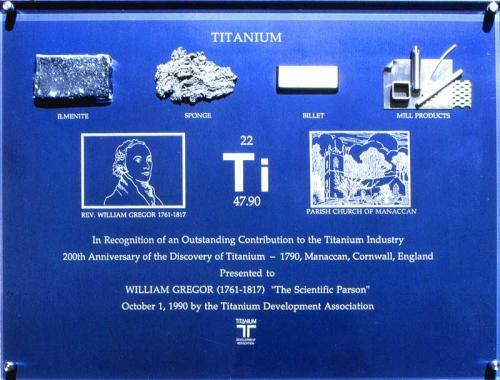 In 1990, we were honored with a commission to make a plaque of titanium commemorating the discovery of titanium in Cornwall, England. We were given some materials by the Titanium Development Association (now the International Titanium Association) to help design the plaque, including a copy of a painting of the discoverer Rev. William Gregor. We included a glass vial of ilmenite (from which titanium can be refined), titanium sponge, an ingot of titanium, and some mill products. Here’s a fascinating connection between a technique I use with titanium wedding rings and really, really ancient knowledge. I am using a twentieth-century metal employing a process that was first described by Homer in The Odyssey circa 800–600 BCE.